it is the weekend again and now is the time to reflect on our past performance. In the last review, we noted that the EUR/USD held it’s ground despite a number of negative issues. This was probably due to the greater number of negative data streaming out from the US. Investors were starting to question how robust the recovery of the US economy is. From a technical point of view, the 1.3 line will probably be a center of activity as the market consolidates and determine it’s next course of action. 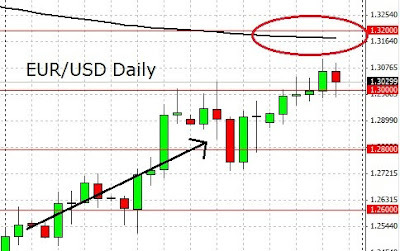 Look at the EUR/USD daily chart, the bullish moment is a pretty strong one for the month of July. Early week saw the bullish momentum continuing on. Most of the economic data from the Euro Zone were good and this brought sentiments up as investors felt that the worst is probably over. Although the US CB Consumer Confidence came out worst then expected, the market only suffered a temporary dip before the bullish climb resumed. Towards the midweek, the EUR/USD continued to range around the 1.3 line. Over at the Euro Zone, the German Prelim CPI came just as expected. On the contrary, the US releases were generally worst than expected. The core durable goods orders were down and it caused investors to be concerned about the US economy. As the end of the week approached, continued positive data from the Euro Zone brought the EUR/USD up. The German unemployment change indicated a drop of unemployment in Germany and this was welcomed by the investors. Having said so, we saw a new round of strikes in Greece as truck drivers protest against the government plans to open up the freight industry. This is inevitable as this was part of the condition upon accepting the loan package from the EU / IMF. The protest caused shortages of fuel and tourism is affected. We need to remember that the Euro Zone crisis is not over yet. On Friday, we received a double blow as the US Advance GDP and the German Retail Sales came out worst than expected. This brought back risk aversion causing the day to end bearish. I read a report with regards to the cooling of the US economy. As the jobs market continued to be depressed, big ticket spending will continue to be scarce and hence economic stimulation will be low. Once again the US continues to face challenges including the massive deficit. More and more economic experts are warning that we may be hitting past the point of no return which is definite default of the US. Having said so, the Euro Zone is not without it’s problems. With the recent blessings of numerous economic data, sentiments are good and hence no one rains on the party. Now if any adverse event happens, the market may just fall like stumbling blocks. From a technical point of view, we face two interesting factors now. The 1.3 line may continue to remain as a center of activity and make the forecast of direction difficult. 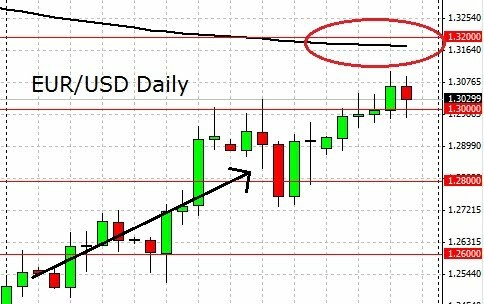 The 200 EMA of the EUR/USD daily chart lies just above the current price action. Historically, the price often react with the EMA. Now the tricky part is if the EMA will function as a resistance or a clear break will result suggesting continued bullish momentum. Next week brings us numerous important data releases including the Euro minimum bid rate and the crazy margin call event US non farm payroll. You can find the list of the various economic releases in the Economic Calender below. Caution is advised. Trade safely. Hi Everybody. 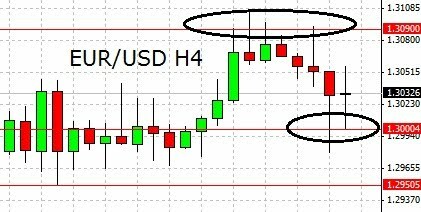 This time I want to share with you guys about something interesting I found on EUR/USD daily chart. As you can see on my daily chart below, we have 4 wedges. The first is the rising wedge, which gave us a valid bearish reversal signal after price broke below the formation. The second wedge is a falling wedge, which is a bullish reversal pattern but failed after price break below the formation and continue the bearish rally. The third one is another falling wedge which gave us an accurate bullish signal after price broke above the formation lead us to current strong bullish phase. And now, we have the fourth wedge, another rising wedge, which is a bearish reversal pattern that should be watched closely next week. We have two simple scenarios here. If price break above the formation, the rising wedge bearish scenario fails and EUR/USD could continue the bullish rally testing 1.3341 (April 30 high). On the other hand, if price break below the formation, the bearish scenario will be confirmed at least testing 1.2735 – 1.2650 region. From past experience we know that sometimes these wedges scenario work, sometimes they don’t, just like any other chart patterns or technical tools. So for the upcoming week, all we need to do is to react correctly to whatever happened to the fourth wedge. I hope this simple information is useful for your own trading plan. Gooooooooooood day forex trading koalas ! We know it and we want it. IT IS CASH YOUR PIPS FOR BEER DAY !! If you are green, stay so and not let a bad trade ruin your weekend. If you are red, do not let your emotions rule you. The market will be there next week. In fact TheGeekKnows.com will be there next week too. YaY ! Yesterday we noted that investors are probably shunning away from the US Dollar due to continued disappointment. Nevertheless we must not forget that the Euro Zone Crisis is not over yet and Greece saw strikes again yesterday due to the economic reforms. Consequent of the acceptance of the EU / IMF loan package. And now it is time for me to shamelessly boast. I LOVE IT WHEN MY CHART WORKS X 2 I mentioned yesterday that we are challenging the 1.3090 line and it may be a resistance. INDEED IT IS ! In fact it is now testing the 1.3 support. The S&P 500 fell today. At around 1100, it is probably a result of dampen sentiments. The US Advance GDP clocked in worst than expected. With a massive deficit and a fragile labor market, this is not a surprise. So why is the EUR/USD holding back on the ride up? The German Retail Sales came out worst than expected too ! It is negative and being the largest economy in the Euro Zone, investors will take notice of it. The end result? 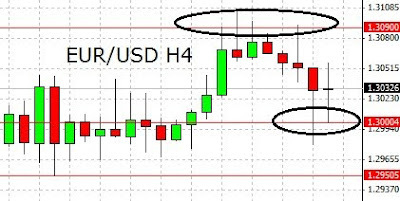 The ranging EUR/USD today! As the day draws to a close, just be on a lookout for sudden moves due to profit taking on a month end. I watched some videos on youtube yesterday regarding how aliens might have helped the ancient civilizations build their monuments. The Pyramids is one example. Let me ask you. If the Seti project finally discovers intelligent signals from outerspace, shall we make an effort to contact them? The EURUSD finally made a clear break above 1.3000 resistance yesterday, topped at 1.3106 but closed a little bit lower at 1.03075. This fact could trigger further upside pressure testing 1.3213/70 region before testing 1.3340. However, as you can see on my daily chart below, we have a trendline resistance which is located around 1.3120 that need to be broken to the upside before continue the bullish pressure. Immediate support at 1.3045/20 region. Break below that area could lead us into neutral zone in nearest term testing 1.2950/30 support area but overall we are still in strong upside phase and I still prefer buy on dips. The EURJPY was indecisive yesterday but we had some bearish pressure earlier today in Asian session and price is now back below 113.50. The way I see it, it is a false breakout which potentially trigger a bearish pressure testing the trendline support (white) and 111.60/50 support area especially if price consistently move below 112.70/60 support area. However from a longer term perspective this fact lead us back into range and neutral area of 113.50 – 108.07. The GBPJPY had a bearish momentum yesterday, back below the range area and keep moving lower earlier today in Asian session. We have a false breakout scenario here which usually trigger a bearish pressure testing 133.70 area even could push price lower testing 130.50 in longer term. Only another movement above 136.30 could potentially continue the bullish correction scenario. The AUDUSD had a moderate bullish momentum yesterday, topped at 0.9042 and closed at 0.9003. The main scenario remains bullish but as long as we have the rising wedge formation I will keep out from the market. The rising wedge formation is a bearish warning that I don’t want to ignore. Immediate resistance which also the nearest term bullish targets is seen at 0.9070 and 0.9135 area. On the downside, initial support remains at 0.8858. The GBPUSD made another indecisive movement yesterday. The bias remains neutral in nearest term but still within a strong bullish context. Immediate support at 1.5580 area. Consistent move below that area could trigger further downside pressure testing 1.5470 key support level but I still prefer to buy on dips as long as price move inside the bullish channel. On the upside, a clear break above 1.5685 resistance area could trigger further upside pressure targeting 1.5750/60 before testing 1.5815. The USDJPY had a significant bearish momentum after break below my trendline support and now seems ready to test 86.33/25 key support area. Break below that area could trigger further downside pressure testing 85.86 even 84.82 region. However, we know that 86.33/25 region could be a strong support at this phase. Not to mention that we also have a falling wedge formation as a bullish warning. A failure to break below 86.33/25 and a break above the falling wedge could trigger another upside pullback testing 87.00/50 resistance area, but the main scenario remains bearish. The USDCHF had a significant bearish momentum after break below 1.0560/40 yesterday, slipped below 1.0399 and now struggling around that area. The bias is bearish in nearest term targeting 1.0320 before testing 1.0220 especially if price able to move consistently below 1.0399. immediate resistance at 1.0500. Break above that area could lead us into neutral zone but the main scenario remains bearish and I still prefer to short on rallies.